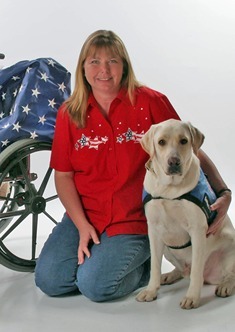 My name is Lori Stevens, and I am the Founder and Executive Director of Patriot PAWS Service Dogs. In 2005, I was working as a professional dog trainer when I was asked to help a group of disabled veterans train their dogs. After working with these veterans and visiting the VA Hospital in Dallas, I realized just how many of our disabled veterans are in desperate need of assistance dogs and I knew I had to help. With the help of a few friends and family, I started Patriot PAWS Service Dogs in a small storefront in Rockwall, TX, training only about 8 dogs at a time. Patriot PAWS has long since outgrown that little storefront and our Rockwall campus now includes administrative, training, and kennel facilities where we are able to train and house as many as 25 dogs. Working with our volunteer puppy raisers and our innovative Prison Training program at the Texas Department of Criminal Justice, we are able to train an additional 35 dogs in other locations and place about 10-15 Patriot PAWS Service Dogs with disabled veterans each year. It has been an exciting journey! But with over 100 disabled American veterans waiting for a Patriot PAWS Service Dog, there is still much work to be done and we need your help. Please consider donating your time, money or resources to help us help those who served. A young lady once told me that I’m her hero. I was taken aback by her words, and upon reflection, concluded that I’m no hero, that heroes are those who have served our country and sacrificed so much for all of us. What I am is a truly blessed person who, with the help of my staff, volunteers and inmate trainers, is able to give back to these true heroes to make their lives just a little bit better. We owe them far more than we can ever repay, but we’re doing what we can, four paws at a time.